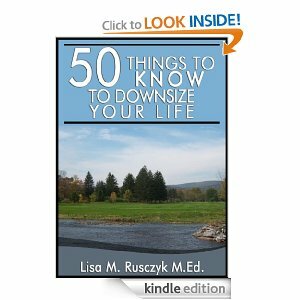 50 Things to Know to Downsize Your Life. Back to Basics. I was a college graduate that went straight into the workforce. My husband and I lived in a small apartment until we decided we wanted a house to have children in. All my life I dreamed of a large “model” home. The kind you see in Home Alone. Big spacious rooms. Maybe even a wrapping paper room. I then moved into an newer 1100 square foot house where I wanted to start my family. I tried to organize on the weekend but until I was a stay-at-home Mom, I realized that all my priorities were wrong. I created this plan to clean a different part of the house every day. I created a spreadsheet, I put everything on there, then did it for about two weekend. Why would I want to spend almost every day of my waking life thinking about how I have to clean or cleaning? I love the tiny house trend. I think this house is a perfect size for us. I will need to do some creative thinking, and get away from commercialization but I think I can do it and I know you can too. My goal is to get my house where I want it so I can spend time on the things most important to me. Relationships and experiences. That is where I hope to spend my time and money in the future. Stop buying stuff, stop cleaning stuff, stop organizing stuff, and live your life! While relationships are a priority, living your life with an extra room you don’t use, or things that may be used by a guest for three out of 365 days of the year is a waste. I am not saying you should not have people over. They can stay at a hotel if they want a hotel quality room, or borrow your things. Cost to stay at a hotel for 3 days a year. $300. Cost to have a room that you will need to heat and cool, furnish, and clean for 365… probably more. You only need one pair of quality sheets. When they get dirty wash them. Just buy what is most comfortable to you. You can spend a little more on good quality because you only need one. When you are done with them donate them and buy yourself once nice set of sheets. Do people still really change their comforter for the seasons? Then you would have to store this comforter. Get one that you can use all year. Who needs a king? I like to feel the warmth of my husband under the blankets. I had a stack of towels that were falling over in the closet. Every time I would do wash I would have to stuff them in to where the pile would fall over. A person needs a clean towel and a dirty one. When the towel gets dirty, clean it. You don’t need them. Find the recipes online and bookmark them. They are taking up space. Don’t have a cabinet of take-out containers with the containers and lids thrown about. For about $15 you can buy a Handy Gourmet Swirl Around Food Storage Containers. This will take up 1 foot by 1 foot of your home. I know you want to save those other containers, but even though they were free, storing them is expensive. Recycle them. Ever since I got pregnant I have worried more about my families health. I was not “eating for two” but I was providing nutrition for someone who could not make a choice on their own. Since then I have been trying to prepare healthy meals ahead. Before I use to bake to relax and distress. Now I am trying to chop instead. Here are some of my prepare ahead food ideas. Using this food storage container organizer to store the containers has been great! No more searching for the lid. This is very easy to organize as I take them out of the dishwasher. These plastic containers are amazing. We do not need to have an entire cabinet of plasticware. Just a place on the shelf. These food storage container organizers will take up 1 foot by 1 foot of your home. I know you want to save those other containers, but even though they were free, storing them is expensive. Recycle them. Please leave more tips for others to store their food. Once you start to have a system to put your paper, plastic, and cardboard, you won’t even think about doing it. Now that you are composting and recycling, you probably have less trash. Call the company to see if your billed can be lowered. Many companies charge by the bag per week. Since I had a little extra time on my hands, I decided to make my future life a little easier and organize a little. I am pretty happy with the results. 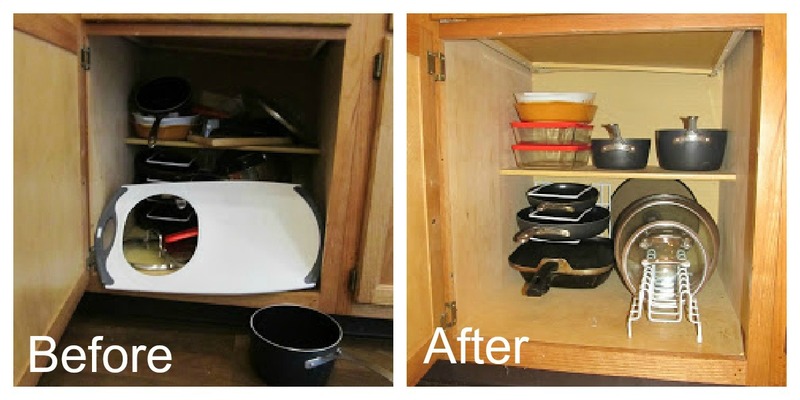 Clean out kitchen pots and pans. Only keep the materials you use monthly in the main cabinets. But other pans and appliances on higher shelves or donate them. This cutting board was too large for us. We decided to buy a smaller one that was easier to store and clean in the dishwasher. Homework: Clean out cabinets and donate the materials you are now using. Think about the food you prepare and what appliances you still need. We keep the electric knife in the over the microwave cabinet since we only use it around holidays. This is where we keep all the pots, pans, crock pot, rice cooker, and pressure cooker. The pan rack and the lid rack are very helpful. These letter storage containers are from Ikea. I secured them to the wall with L brackets. We keep pens and paper in the top one and mail and bills in the bottom. This cabinet contains many organized items. The top shelf is a shelf that I can not reach. Here we put storage for food that we found on sale. The second shelf has our food storage container organizers and measuring cups. The last shelf has our plates and bowels on storage racks. I love having all the same silverware. Keeping them organized in a simple, easy to clean in the dishewasher tray is easy. Before I cleaned out this drawer there was 3x as many serving spoons in this drawer. I put the other spoons in the holiday section over the refrigerator (a cabinet we don’t use often) and only kept the things that we use the most in this drawer. Keep family cups straight with this tile with names on it. I bought the tile at lowes and added our names with a sharpie. To try and have less dishes in the dishwasher, I made this tray out of a tile from Lowes. I sharpied lines on the tile, and wrote our names on each section. So far there is less dishes in the dishwasher, and the cups are not sitting on the counter and kitchen table. We have rechargeable batteries at our house. To organize them I created two containers from recycled Gerber formula containers. Now even our batteries are organized and we can change them all at one time. A great quick read. This book was written and published in 2013.